While Haier may not be the most recognizable name in the refrigerator business, the Chinese company is one of the world’s top-selling home appliance manufacturers. The company originally was founded as Qingdao Refrigerator Co. in 1984. It later became Qingdao Haier Group in 1991 after diversifying its products beyond that of just refrigerators. Later in the next year, the company simply became Haier Group, which remains the name of the business today. In the year 2000, Haier began to produce refrigerators for the North American market, with a fair amount of success and with revenues reaching $200 million in the United States alone by 2002. Eventually, the business attempted to acquire Maytag Corporation, one of its direct competitors, in 2005, but the bid eventually was lost to Whirlpool Corporation. What Is This Type of Product? 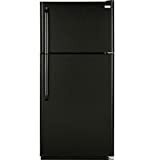 Haier makes refrigerators in many different styles, from models that feature side-by-side doors to those that have French door designs with bottom freezer drawers. Haier even offers the standard refrigerator design with a top cabinet freezer. Haier refrigerators are designed to keep all of your fresh food at its optimal temperature and in the best environment possible while keeping your frozen food at steady freezing temperatures. A refrigerator keeps all of your perishable items from spoiling by circulating refrigerant through piping that runs throughout the interior of your refrigerator as well as coils on the rear exterior of the unit. A compressor in the refrigerator compresses the liquid refrigerant into a gas, and as the refrigerant is compressed, pressure rises, and the refrigerant is forced through the pipes. The hot gas eventually flows through the copper tubing on the exterior of the fridge, and the ambient air around the pipes allows heat to dissipate from the refrigerant, which returns it to a liquid. The liquid refrigerant, still highly pressurized, then flows through an expansion valve which has the pressurized liquid refrigerant on one side of the valve and a low-pressure area on the opposite side. The low pressure results from the compressor pulling the evaporated refrigerant as it passes through the valve. This returns the refrigerant to the compressor, where the cycle starts again. 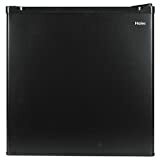 Haier refrigerators can be purchased in many places where home appliances are sold as well as online at Haier’s own website. We believe that it is important to bring you accurate and honest information when it comes to the purchase of a new refrigerator. We understand that this purchase will not be an impulse buy, and therefore a lot of research and attention to detail should go into selecting the right model for you. For this review, we first gathered all of the product details and specifications of these refrigerators down the most minute detail. Then, we compared these details with the opinions of customers who have already purchased each model in order to obtain a clear understanding of the true nature of these refrigerators. The LED lighting of the HRQ16N3BGS gives you a bright and clear light that uses less energy than incandescent lighting. The quick cool and quick freezing functions speed up the time that it takes to cool newly stored food while protecting those which have already been stored. Additionally, the dedicated high and low humidity crispers allow you to place all of your goods in their proper environment. No protruding handles make the HRQ16N3BGS aesthetically pleasing with a sleek design. Interior door shelves are large enough to store gallon jugs, which will allow you to have more shelf space. The HRQ16N3BGS is on the higher side of the Haier refrigerator price spectrum. A one-year warranty on parts and labor is included. The HRF15N3AGS offers external temperature controls and child locks for complete control over your refrigerator. This model of Haier refrigerator also includes Sabbath Mode that disables certain features of the refrigerator in accordance with Shabbat practices. The quick cool function keeps all of your food at optimal storage temperatures while bringing newly stored items down to temperature speedily. The stainless steel design allows the HRF15N3AGS model to be integrated into any present-day kitchen. The operation of the HRF15N3AGS is quiet, so it will not disturb your daily activities. Some customers noted that they would have liked a little more space. A one-year labor and parts warranty is included. The HRB15N3BGS has clear bins as door shelves that free space on shelving within the cabinet of the refrigerator. Additionally, this model is equipped with quick freeze and quick cool settings to keep your fresh and frozen items at their best temperatures, and it cools and freezes your items swiftly. Inside the refrigerator, there are three full-width shelves and two are adjustable. The handle-less design complements the stainless steel construction and gives this appliance a modern and sleek look. Easily monitor the temperature inside the refrigerator and freezer from the front panel. 15 cubic feet of space may not be enough room to accommodate larger families. This model includes a one-year warranty on parts and labor. The HRT18RCPB features analog temperature controls for simple and effective operation. Two full-width door bins are included with a spill-proof glass shelf that saves space on the refrigerator’s inner shelving. The clear storage bins allow you to see everything you have stored at a moment’s glance, and the interior LED lighting will help you to find items quickly. The automatic defrost will help reduce frost buildup in order to simplify maintenance needs. The stainless steel finish of this model helps to keep the refrigerator clean and free of smudges, while also providing a sleek aesthetic. The controls are simplistic for those who do not want advanced controls. The size may be too small for some families. This model is a traditional refrigerator with pocket handles. It also has reversible hinges that allow you to change the direction that your refrigerator opens to best fit your space. The interior Spill-proof glass shelves are adjustable. Some families may need more space. The Haier HC27SF22RW refrigerator offers LED interior lighting and shelves with pocket handles for a sleek look. Additionally, there is a clear drawer that has adjustable humidity to preserve your produce. The bins in the door are gallon-sized, so you can store milk and other awkward containers. This refrigerator also comes in black. Some families may require more room in their refrigerator. 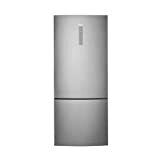 The HRT18R1APW Haier refrigerator has an ice maker and gallon door bins included. The wire shelving on the interior is adjustable so that you can fit everything that you need. This model is larger in size than the previous model but is more cost effective. The crispers are clear for easily finding the produce that you need. This refrigerator from Haier is equipped with clear dairy bins and opaque door bins to keep what you want visible. It includes wire shelving on the interior that is adjustable. The hinges are reversible, which allows you to configure the door in whichever way is more convenient for you. This model also comes in white. Some customers may dislike the wire shelving. This is a stainless steel Haier refrigerator with interior lighting and adjustable glass shelving. It is also equipped with crispers that are humidity controlled. The stainless steel construction gives a modern appearance. Some families will require more room. This Haier refrigerator has LED lighting on its interior as well as humidity controlled produce bins. The glass shelving can be adjusted how you need it. The pocket door handle gives the refrigerator a sleeker look than if it had a protruding handle. Many families will need more space in their refrigerator. After a thorough review, we have concluded that the HRQ16N3BGS - 16.4 Cu. 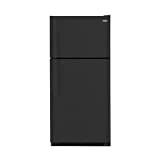 Ft. Quad Door Refrigerator, HRF15N3AGS - 15 Cu. 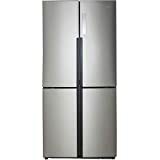 Ft. French Door Refrigerator, HRB15N3BGS - 15 Cu. Ft. Bottom Freezer Refrigerator, and HRT18RCPB - 30 Cu. Ft. Top Freezer Refrigerator are the Best Haier Refrigerators available in 2019. These models are all constructed with a sleek stainless steel design that keeps them clean and smudge-free. Haier offers a model for every need, whether you prefer traditional top freezer models or other more modern designs.